Sounds good, but it´s not! European Central Bank President Mario Draghi hit back at a warning from Germany’s Bundesbank that the ECB shouldn’t overreact to a sharp drop in oil prices, underlining his readiness to launch additional stimulus to shore up ultralow inflation. In a speech at the Bundesbank’s home in Frankfurt, Mr. Draghi warned that central banks “cannot be relaxed” in the face of a series of shocks to commodity prices. “The longer inflation stays too low, the greater the risk that inflation does not return automatically to target,” Mr. Draghi said. The back-and-forth between two of Europe’s most influential central bankers underlines the debate within the ECB about how urgently the bank should respond to sharply lower oil prices. 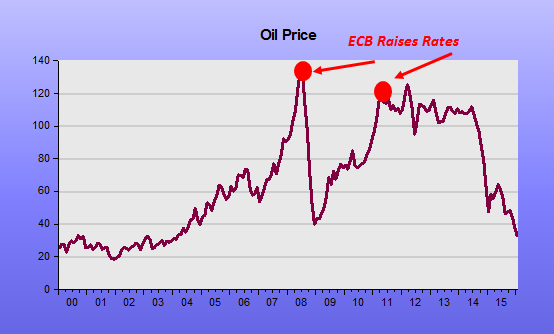 It´s a mirror image of what happened in 2007-08, when oil prices were rising and central bankers felt “compelled” to tighten lest inflation permanently rose! 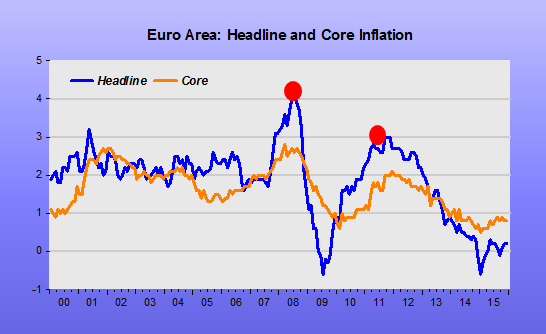 This is one more evidence against “Inflation Targeting”. It also shows how, in practice, central banks have an “asymmetric view” of the target! “Question: You talked about the inflation picture being less sanguine. Can you just explain a little bit more to the public why you think you have to fight so hard against low inflation? Especially for lower and middle-income people, spending less at the gas station, spending less at the grocery store is helping their purchasing power. You’ve said before, people buy more stuff when inflation is low. Why spend all this money on government bonds to fight something that a lot of people would say is a good thing for them and for their budgets?My second question is, is there a risk that the ECB will just kind of fall into a trap of QE without end? That you keep doing it, that you keep buying government bonds? We see it from the Federal Reserve’s experience, whether or not they start raising interest rates. Is there a danger that this stimulus keeps going on and on and the markets just come to expect it and that you won’t be able to get out? Draghi: Let me respond first to your second question. 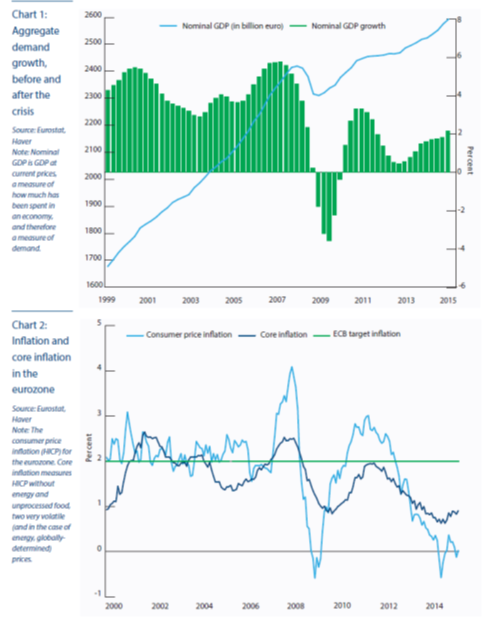 The projections of recovery both in output and inflation are based, are conditional on the full implementation of the QE programme as announced in January and the full implementation of all the credit-easing measures that have been announced in the course of 2014. So we have to continue on that. On the other hand, they were also based on a set of technical assumptions concerning exchange rates, oil prices, external demand, growth in output and so on. And to the extent that these conditions change and possibly worsen, we will have to adjust our QE programme or in general our monetary policy stance. That’s the sense of our discussion about downside risks. On why to fight low inflation: I’ve discussed this many times. Low inflation on one hand has a supporting power for real disposable income. On the other hand, it increases the real value of debt. As we’ve seen, low interest rates promote consumption and it’s essential for the recovery of growth and economic activity. That’s why we’re fighting. But to fight low inflation doesn’t mean that we want high inflation. We just want to be compliant with our mandate, which is to drive inflation back to below but close to 2% in the medium term. I understand the Vice-President may want to add something on the first question. Constâncio: Yes, I would like to add something. Because it’s the second or third time that you asked that question, so let me add something. First, let me remind you that some years ago in the US there was a commission headed by an economist called Boskin to examine the measurement of inflation. And the conclusion of the Boskin Commission was that the way inflation is measured, in particular the type of indexes that are used, Laspeyres indexes, tend to exaggerate the measurement of inflation, in the case of the US by 1.5 percentage points. So, if the target would be zero, very likely we would be targeting a negative inflation rate. So there is a measurement problem with inflation which justifies that the target for inflation should be above zero. Second point is the point that the President just reminded you about debt deflation, and when there is a situation of high indebtedness, when inflation is very low, the burden of servicing the debt increases and that is very detrimental to the economy. The third point is that with very low inflation or negative inflation, the real interest rate increases, and when the nominal rate cannot go below zero it means that the interest rate in real terms may be above the equilibrium real interest rates that would equal savings to investment at the level of full employment. So that’s another reason why negative inflation rates can be detrimental. Then there are the deflation risks – real deflation, not what you implied in your question, because to have negative inflation for a few months is not a deflation situation. A deflation situation is a situation of prolonged period, meaning more than one year, of negative inflation. And in that case you have two phenomena: you have an increase in real wages, because there is rigidity in nominal wage growth to not go negative, so you will constrain supply, profits of firms, and you hit growth. And second, there is also then in such a situation a problem of consumers postponing their expenditure, if deflation lasts long enough; when we are talking about real deflation, not just a few months of negative inflation.